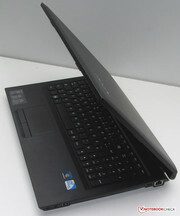 According to Lenovo, the models of the B-series are "budget-friendly notebooks for home and home office". The features and the price range certainly support this statement. Our test sample comes equipped with an Intel Pentium B960 dual-core CPU, an Intel HD Graphics (Sandy Bridge) GPU, and 4GB of system RAM. The hard drive has a capacity of 320GB. Even a DVD-RW drive is on board. 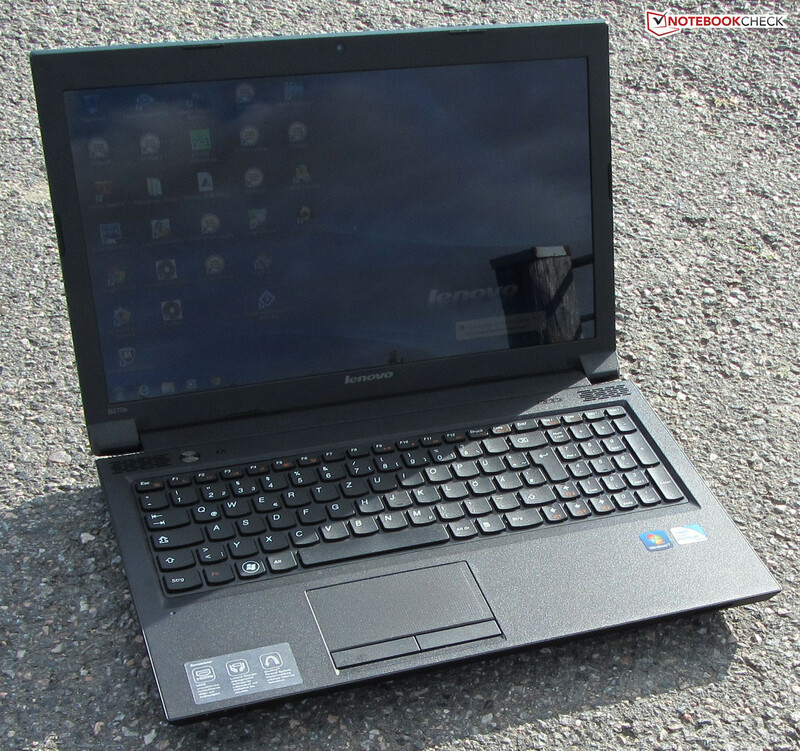 We reviewed another member of the series – the Lenovo B570-M58G4GE (Intel Core i3-2330M, Intel HD Graphics 3000) - not too long ago. 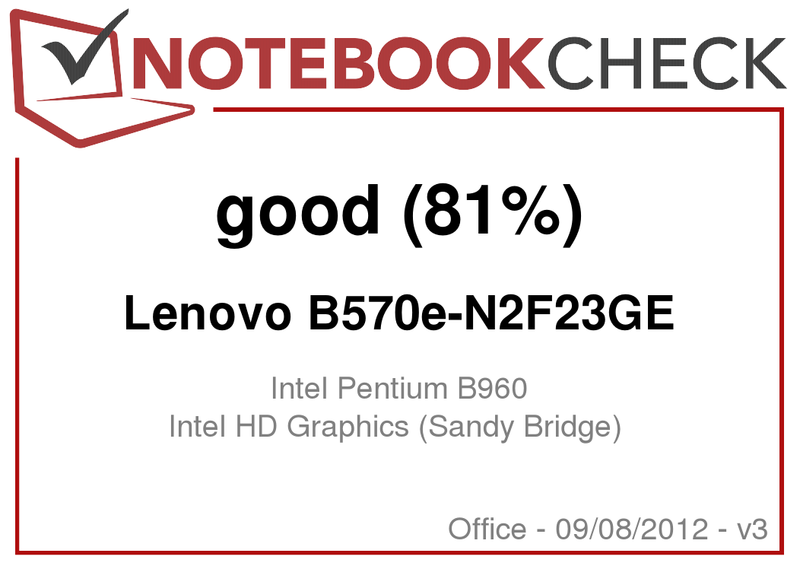 For our evaluation, we compare this notebook to two competitors: the Sony Vaio VPC-EH3C0E/W (Intel Pentium B960, Intel HD Graphics (Sandy Bridge)) and Lenovo’s own G585 (AMD E2-1800, AMD Radeon HD 7340). The first look leaves no doubt: this notebook is designed to be a tool. The chassis is very similar to the one Lenovo uses for the B570-M58G4GE, but the surfaces are textured differently. The B570e-N2F23GE is entirely made from matte, black plastic. Only the display is glossy. Since the surface isn't smooth, it's not very susceptible to fingerprints. The quality of the construction and overall sturdiness is quite acceptable. For more information on the chassis, please take a look at the review of the Lenovo B570-M58G4GE. The notebook's construction: matte, black plastic. The textured surface is not prone to finger prints. Access hatch at the bottom. The number of the ports and their location is identical to the Lenovo B570-M58G4GE, although the Lenovo B570e-N2F23GE lacks the USB 2.0/eSATA combination port. In addition, the fingerprint reader is also missing. 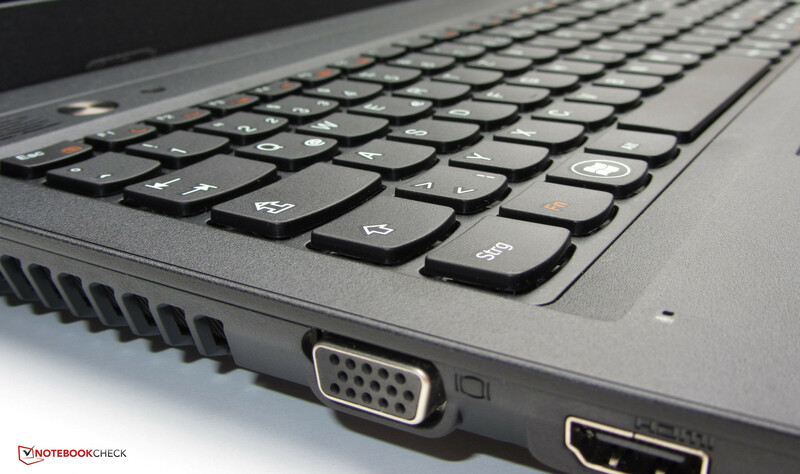 Otherwise all ports one might need are included, even though USB 3.0 is not offered on any notebook in the Lenovo B570 and B570e series. The left side features a USB 2.0 port, a HDMI port, a VGA port, the connector for the power adapter, and a Kensington lock slot to secure the laptop. The right side of the notebooks houses two additional USB 2.0 ports, the Gigabit-Ethernet connector, two audio jacks (microphone in, headphones) and a DVD-RW drive. The front features a card reader, which supports the following types of storage media: SD, SDHC, MMC, Memory Stick, Memory Stick Pro, and xD. Our test system features a (not identified) WLAN module from Broadcom. The module supports the usual standards 802.11 b/g/n. For wired connections via RJ45, Lenovo sources a well-known Gigabit-Ethernet controller from Realtek (RTL8168/8111 family). A Bluetooth module is not part of the package. The display frame houses a webcam. The only additional items in the box are a quick-start guide and pamphlets with security and warranty information. 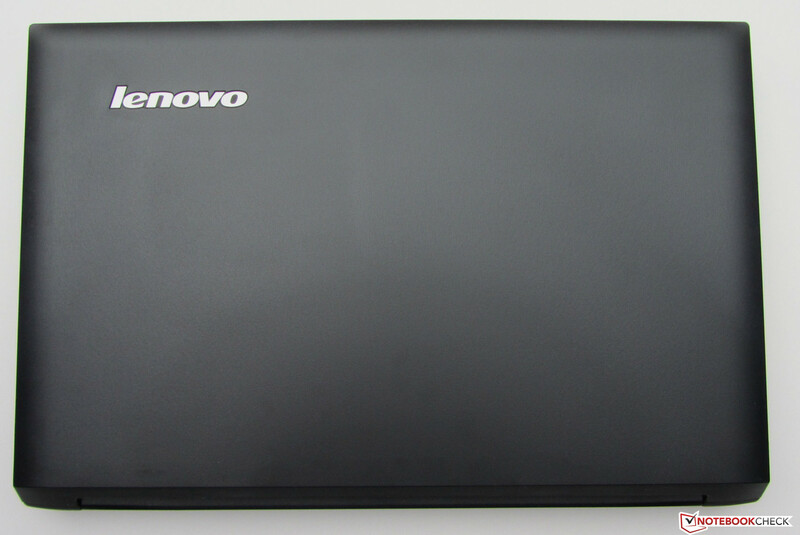 The Lenovo B570e-N2F23GE ships with Windows 7 Home Premium (64 Bit). A Windows 7 DVD is not included. Potential restores rely on the recovery partition. Power button on the left, OneKey Recovery button on the right. System recovery is very easy: with the notebook turned off, the user only needs to press the OneKey Recovery button (the small button next to the power button). The notebook then turns on and starts the Lenovo OneKey Recovery automatically. Once the option "OneKey Recovery" is selected and the image to restore has been selected (either the factory image or one the user has subsequently created), the restore starts. Important to keep in mind: the system will be reset and all data created (and programs installed) after the image date will be erased. Lenovo is pretty generous with the included software. We found the following programs pre-installed: Adobe Reader X, Google Chrome, Cyberlink PowerDVD 10, Cyberlink Power2Go (DVD-/CD burner software), Cyberlink Youcam (webcam software), McAfee Antivirus Plus, Microsoft Office 2010 Starter, and Windows Live Essentials 2011. In addition, Lenovo supplies some specific tools. One example is the Lenovo EE Boot Optimizer, which optimizes and accelerates the system boot and startup process. Port Locker might be more interesting for the business user: it can prevent unauthorized data copy to or from USB attached devices or media cards, unless the user supplies a password. The underside of the notebook is home to a fairly large maintenance cover. Hard drive, RAM, BIOS battery, and WLAN module are all accessible (but the system cooling fan is not). Unlike the B570-M58G4GE, the B570e only comes with one RAM slot (which is home to a 4GB module). Maximum RAM is 8GBbut requires removal of the already installed module. It's pretty easy to swap out the hard drive. One screw needs to be removed - then the hard drive caddy can be taken out. After the old drive has been swapped out for the new one, the caddy gets re-inserted. One caveat: Lenovo uses a drive that is 7 millimeter thick - and not the 2.5-inch typical standard of 9.5 millimeter. Lenovo offers a 12 month depot warranty. In case of a defect, the customer needs to send the notebook directly to the manufacturer. 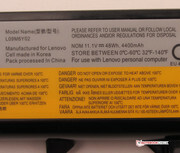 Lenovo offers an extension of the warranty to 24 or 36 months for 30 or 80 Euros, respectively. 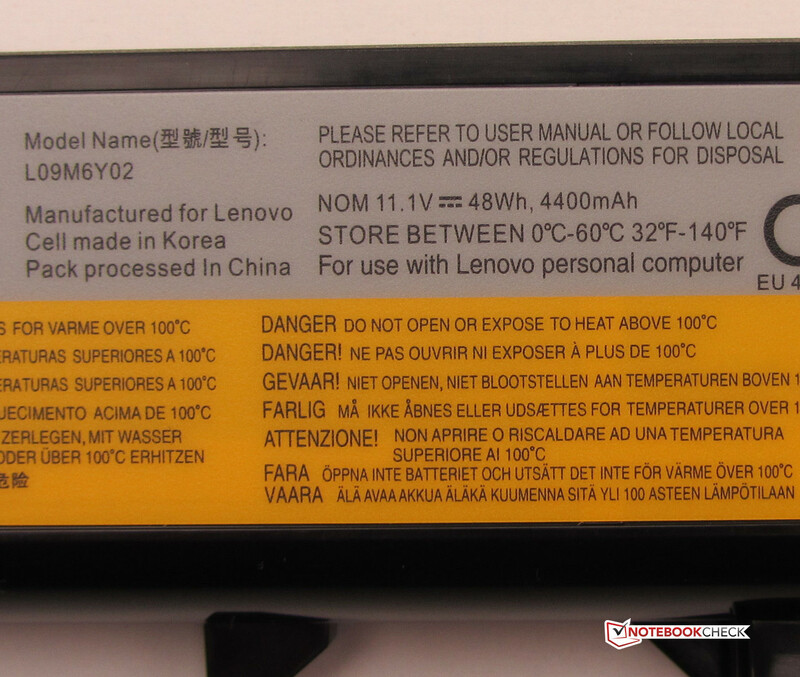 A tip: the Lenovo Online Shop allows the user to enter the serial number of the notebook to find out what warranty options they have available. An extended warranty can then also be purchased directly from a dealer, not just online. 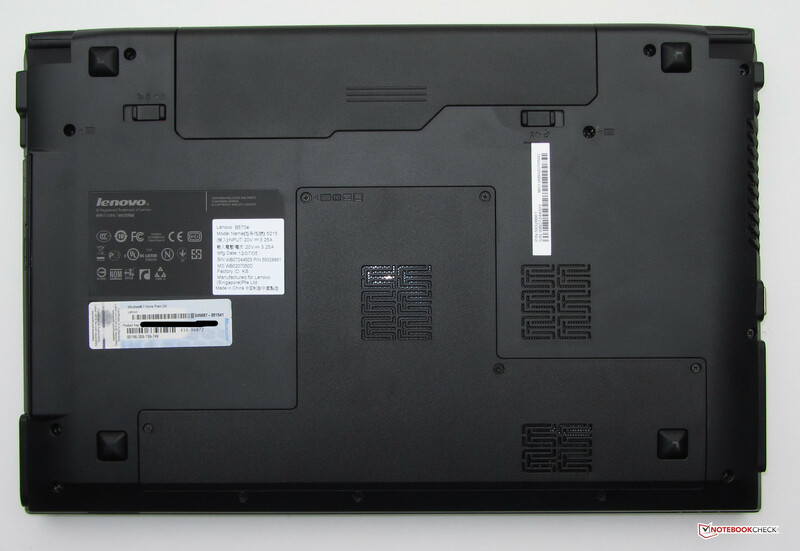 The keyboard of the Lenovo B570e-N2F23GE is the same one found on the Lenovo B570-M58G4GE. Keystrokes are quite precise and the keyboard is well suited for those who need to type a lot. 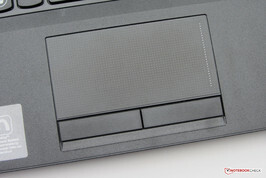 The 10 x 5 centimeter (3.94 x 1.97 inches) touchpad is also identical to the one used in the Lenovo B570-M58G4GE. The surface is slightly rough but fingers glide easily. Since the touchpad is multi-touch enabled, functions like zooming with two fingers and other gestures are supported. The two mouse buttons underneath the touchpad feature clear tactile feedback. The touchpad is multitouch capable. 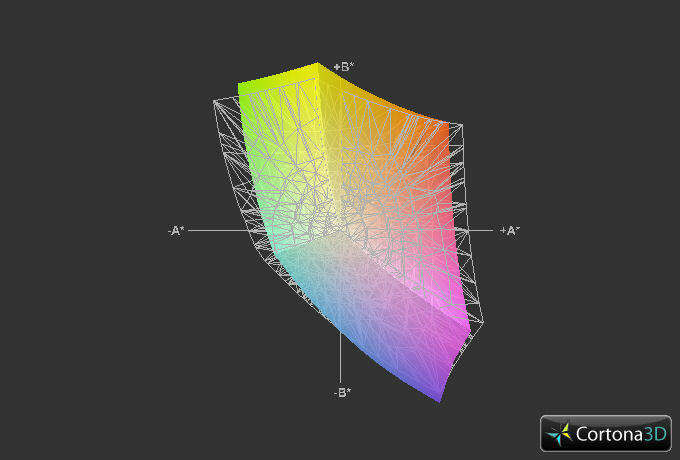 Our test system features a 15.6-inch display with a native resolution of 1366x768 pixels. The panel is LED backlit and is a glare-type. Unfortunately, there are no other display options for the Lenovo B570e - too bad, since a matte display would certainly look better on a business-type notebook. The average brightness of 182 cd/m² is average at best, although the Sony Vaio VPC-EH3C0E/W is only marginally better (199.6 cd/m²). The Lenovo G585, on the other hand, has an average brightness of 236 cd/m² and clearly outclasses both the Sony and the B570e. We measured a black point value of 0.9 cd/m² - again just about average. Given the fact that this notebook resides in the bottom price bracket, the black point is actually quite decent. The contrast is 202:1 and is not particularly great. However, both the Sony Vaio VPC-EH3C0E/W (1.54 cd/m², 144:1) and the Lenovo G585 (1.61 cd/m², 145:1) fare worse in this test. The B570e is not able to accurately reproduce the sRGB and AdobeRGB color spaces. This is not really an issue here, as the system is not going to be used by photographers and graphics professionals. We have to say that the display gets pretty close to the sRGB color space - again something we don't see often in this price range. 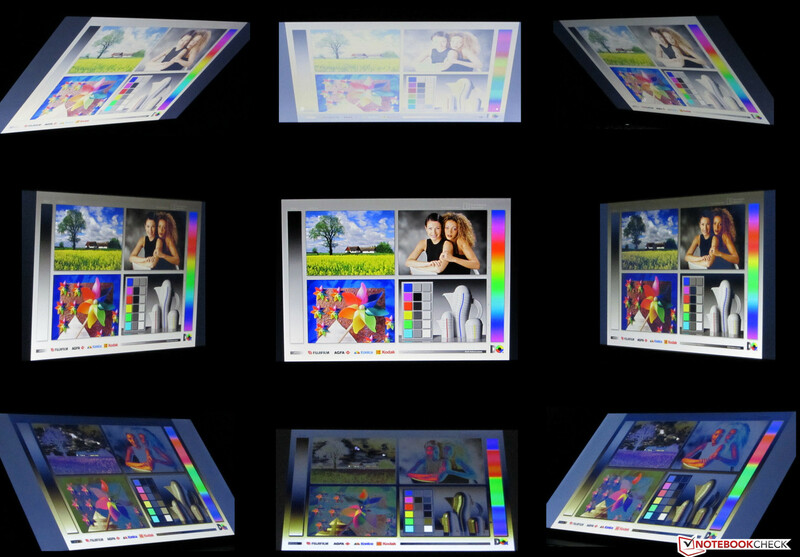 The low brightness of the display as well as the fact that it is highly reflective makes outdoor use almost impossible. The user needs to make sure he or she is in the shade and avoids direct sunlight at all costs. As far as viewing angle stability is concerned, the Lenovo B570e-N2F23GE behaves exactly as one would expect from a low-priced laptop. Even small changes in the vertical lead to a washed out picture and color inversions, while the horizontal plane is less susceptible to changes in viewing angles. 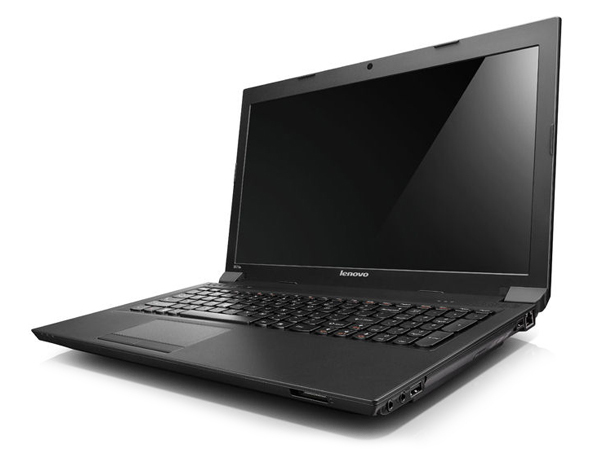 The Lenovo B570e-N2F23GE is a laptop designed for the home and home office user. As such, it's supposed to handle a daily workload of surfing, internet communication, office tasks, and DVD playback. HD videos are no problem for the B570e. When we played a video in FullHD (1920x1080 pixels) and H.264 encoding, we didn't encounter any issues. The processor workload was at around 33% (we used DXVA Checker) and the video played without any lags. YouTube videos in the same format also play flawlessly. Since the notebook also features HDMI out, it can be used as a movie player in the living room, as it is capable of playing all common formats and does so quietly. The Intel GPU takes some load off the processor during playback - Intel calls this functionality "ClearVideo". Without this optimization, the CPU would have to bear the brunt of the workload and subsequently the utilization would be higher. The default program for playing videos, PowerDVD 10, is able to take advantage of the technology, although our test sample had it deactivated (it might be a default setting). Activating the hardware acceleration is simple: open "Settings", select the sub-menu "Video", and place a check mark in the box for hardware acceleration. Our test unit comes equipped with an Intel Pentium B960 processor. This dual-core CPU is a member of the Sandy Bridge generation. Core frequency is 2.2 GHz. A Turbo mode is not offered. During our stress test (Prime95 and Furmark in parallel), the CPU frequency remained stable - throttling was not observed. The GPU frequency, however, fluctuated between 650 and 1100 MHz. Since CPU throttling does not occur, our Cinebench test showed results comparable to other systems equipped with the Intel Pentium B960, like the Sony Vaio VPC-EH3C0E/W. The Lenovo G585 (AMD E2-1800, AMD Radeon HD 7340) is not able to keep up with the other notebooks - not really surprising since it's based on netbook technology. On the other hand, the B570e-N2F23GE is outperformed by the more powerful Lenovo B570-M58G4GE (Intel Core i3-2330M, Intel HD Graphics 3000). 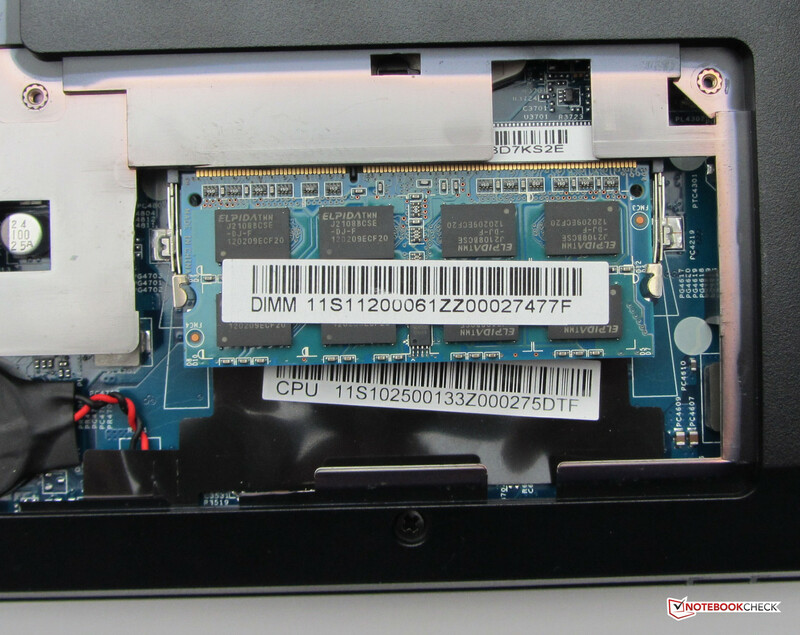 The components of the Lenovo B570e-N2F23GE make it clear that this is not a high performance system. The system would definitely benefit from a Solid State Disk. In the PC Mark Vantage Test, our test system scored similar to other notebooks with an entry-level CPU - examples are the Toshiba Satellite L755D-14U (AMD A6-3420M, AMD Radeon HD 6520G + HD 7450M Dual Graphics) or the Sony Vaio VPC-EH3C0E/W (Intel Pentium B960, Intel HD Graphics (Sandy Bridge)). 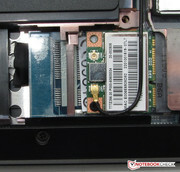 For the B570e-N2F23GE, Lenovo uses a standard (platter-based) hard drive sourced from Western Digital. The hard drive (model Scorpio Blue) has a capacity of 320GB and spins at 5400 RPM. Average transfer rate is 64.5 MB/s - a bit below average for this type of hard drive. The access time of 21.1 ms is also too high. Intel not only supplies the CPU, but also the GPU for the Lenovo B570e-N2F23GE. The integrated Intel HD Graphics (Sandy Bridge) supports DirectX 10.1 and is based on the Intel HD Graphics 2000. This is definitely a very entry-level GPU that offers limited functionality. Quick Sync (Intel's encoding and decoding technology), for example, has been eliminated. The results of the different 3D Mark tests are comparable to other notebooks with the Intel Pentium B960 CPU and Intel HD Graphics (Sandy Bridge) GPU. Examples are Lenovo's own IdeaPad G580-MBBG3GE and the Sony Vaio VPC-EH3C0E/W. Even the Lenovo G585 (AMD E2-1800, AMD Radeon HD 7340) can keep up with the other systems. Since the G585 supports DirectX 11, it can actually win one test (in 3D Mark 2011) that the Lenovo B570e can't complete (since it only supports DirectX 10.1). None of the four systems comes close to the results of the Lenovo B570-M58G4GE (Intel Core i3-2330M, Intel HD Graphics 3000). Those trying to find a gaming rig need to look elsewhere. The Lenovo B570e-N2F23GE is not suitable for demanding 3D games, as the frame rates are just too low. Some games will work with the details and the resolution set to the lowest settings. The (not very demanding) game FIFA 12, for example, works reasonably well. A notebook that's designed for work is supposed to produce as little noise as possible. The Lenovo B570e-N2F23GE certainly fulfills this requirement. During idle, we measured 30.3 dB - pretty much inaudible. One has to listen very closely to hear the hard drive, as it is very quiet. Even under full load (Prime95 and Furmark in parallel), we only measured 36.9 dB - still very acceptable. 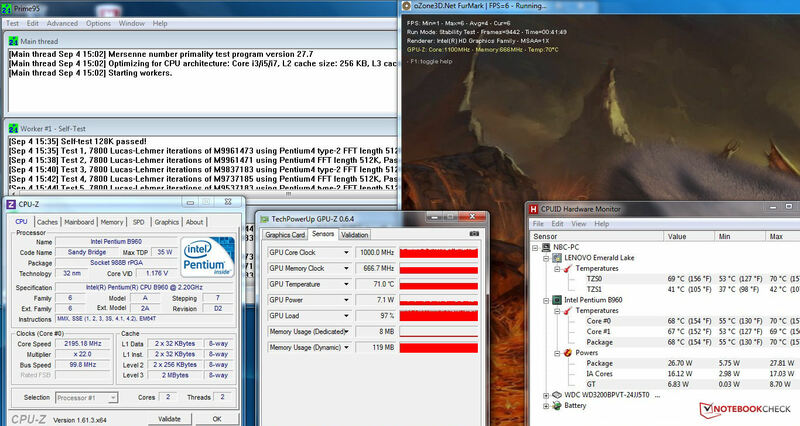 Lenovo B570e-N2F23GE during the stress test. The Lenovo B570e-N2F23GE doesn't run very hot. During idle, temperatures remained completely reasonable. We measured between 27 and 36 °C(80.6 and 96.8 °F) on both the top and the bottom. Working with the notebook on the lap is certainly possible. Under maximum load (Prime 95 and Furmark at the same time), the temperatures only increased slightly to between 28 and 40 °C(82.4 and 104 °FAt the palm rest, we measured about 30 °C(86 °F). During the stress test (we ran Prime 95 and Furmark in parallel for at least one hour) we always had the maximum CPU performance available - no matter if the laptop was plugged in or running on battery. The frequency of the GPU fluctuated between 850 and 1100 MHz (with the power adapter plugged in) and between 650 and 1100 MHz (battery). The temperature leveled out at 67 to 68 °C (152.6 to 154.4 °F). (+) The average temperature for the upper side under maximal load is 31.7 °C / 89 F, compared to the average of 29.4 °C / 85 F for the devices in the class Office. The stereo speakers of the Lenovo B570e are located above the keyboard and sound pretty decent, although bass is lacking. For a business laptop, the speakers are good enough. Those wanting better sound quality can always connect external speakers or headphones. As far as power goes, the Lenovo B570e-N2F23GE is pretty frugal. During idle, we measured a power consumption of 8.3 to 11.7 watts. The values for the Sony Vaio VPC-EH3C0E/W are almost identical. Under maximum load (Prime 95 and Furmark), the B570e consumed 41.8 watts and remained quite a bit under the Sony (49.3 watts). Under medium load (we ran the 3D Mark 06 benchmark test), the Lenovo consumed 31.9 watts, the Sony 37.5 watts. Both notebooks don't come close to the power requirements of the G585 - but we have to take into consideration that the CPU part of the AMD APU is less powerful and power hungry then the CPU part of the Intel Pentium B960. 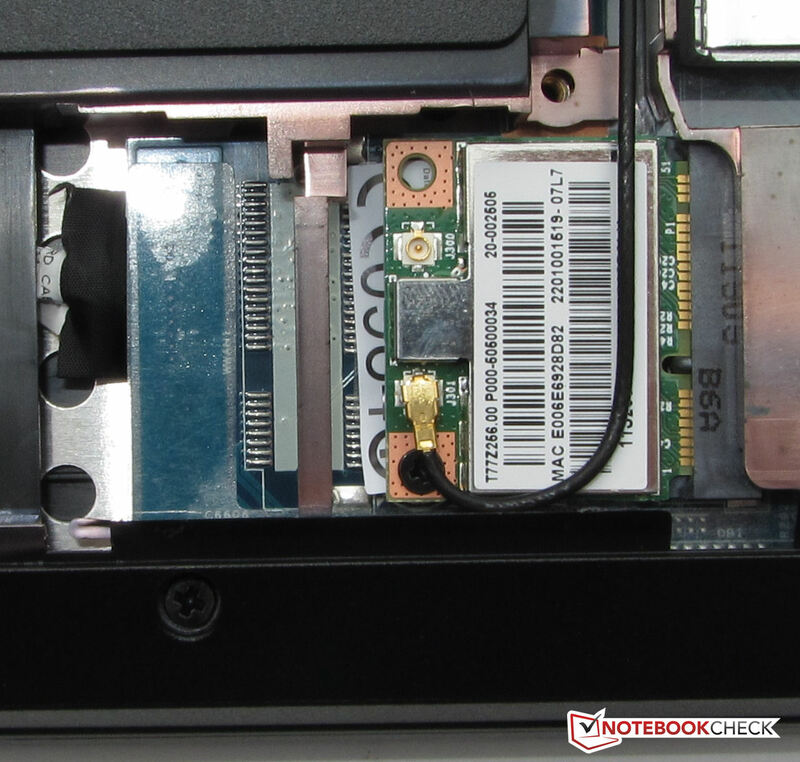 Interesting is a comparison with the Lenovo IdeaPad G580-MBBG3GE: the system features almost the same components as the B570e-N2F23GE but requires more power. We measured a difference of 10 watts during full load and about 4-5 watts more during idle. We don't know the cause for this difference. While in idle-mode, the Lenovo B570e-N2F23GE managed a runtime of 6:47 hours (Sony: 6:12 hours, G585: 8:40 hours) before shutting down. We used the Battery Eater Reader test here - the display is turned down to minimum brightness, the power saver profile is enabled, and WLAN and Bluetooth are disabled. Under load, the Lenovo B570e ran for 1:16 hours (Sony: 1:26 hours, G585: 2:02 hours). To determine the battery life under full load, we used the Battery Eater Classic Test - the display brightness is turned up all the way, the high performance profile is enabled, and the wireless modules are turned on. In our WLAN test (display brightness 150 cd/m², power saver profile), the notebook lasted 3:57 hours (Sony: 4:05 hours, G585: 5:00 hours). For this test, a script visits different webpages in 40-second intervals. When we ran the DVD test (display maximum brightness, wireless off - and either power saver profile or another profile enabled if the playback should lag), the Lenovo B570e-N2F23GE shut down after 3:29 hours (Sony 3:11 hours, G585: 4:01 hours) - long enough to watch two movies. Lenovo frequently releases value-priced notebooks which feature very good price-performance ratios. The Lenovo B570e-N2F23GE is no exception. 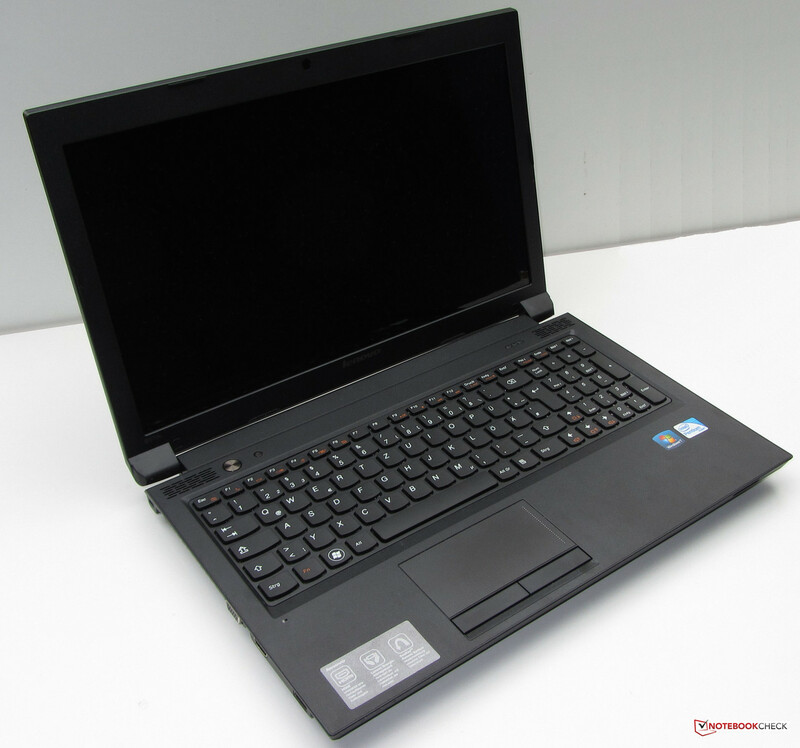 For 390 Euros, the buyer gets an office notebook which can easily handle the daily workload of word processing, internet communication, and DVD playback. The non-glare finish and the very decent keyboard make this laptop a suitable companion for the home office user. Battery life is decent too, those wanting even longer run times should take a look at the Lenovo G585 (which retails for roughly the same amount, features a good keyboard, and handles daily tasks as well as the B570e). 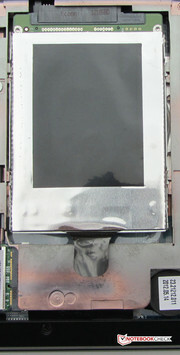 ...and the DVD-RW drive can be removed. The WLAN module is accessible as well. 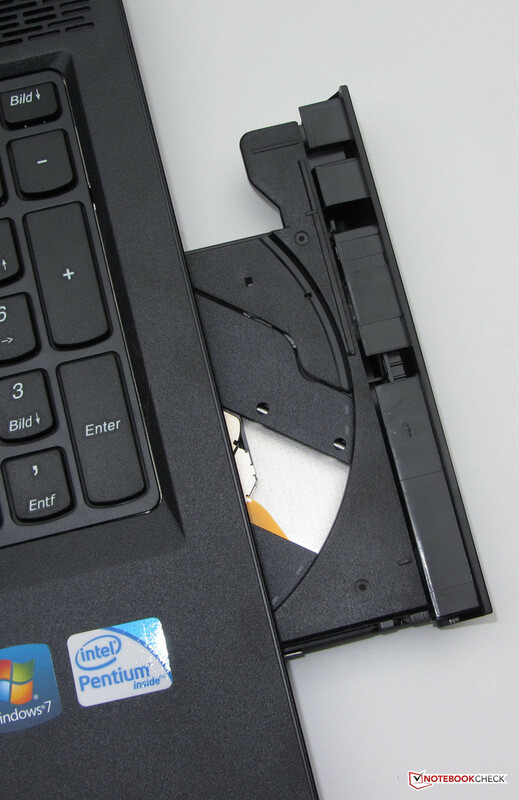 Replacing the hard drive is quick and easy. Only one RAM slot total. The bottom features a large maintenance cover. The DVD-RW drive handles all types of DVDs and CDs. Lenovo calls this keyboard "Accu Type". The notebook remains quiet at all times, offers a surprising build quality, and features a very usable keyboard. A non-glare display with higher brightness and better contrast would turn this machine into a work horse. A sturdy chassis and high build quality are pretty rare in the bottom price bracket. Plenty in this segment of the market: Sony Vaio VPC-EH3C0E/W, Lenovo G585, Lenovo IdeaPad G580-MBBG3GE, Acer TravelMate 5744Z-P624G50Mikk, Samsung RV515-S03DE, Acer Aspire 5250-E304G50Mnkk, HP 630-LH384EA, Acer Aspire 5750Z-4217, and Toshiba Satellite C655-S5542.